It’s here! after seeing GIANT SIZE Super Darumboya by HARIKEN all over Asian conventions we had wondered when collectors will be able to get their hands on one. Todays the day where GIANT SIZE GLITTER SUPER Super Darumboya gets an online release and its the classic HARIKEN GREEN colourway. Originally produced as part of Medicom’s hit VAG capsule series, Japan based artist HARIKEN has teamed up with Unbox to scale the super cute character up to giant size proportions. Shot in a green (if you know Hariken you know it had to be green!) 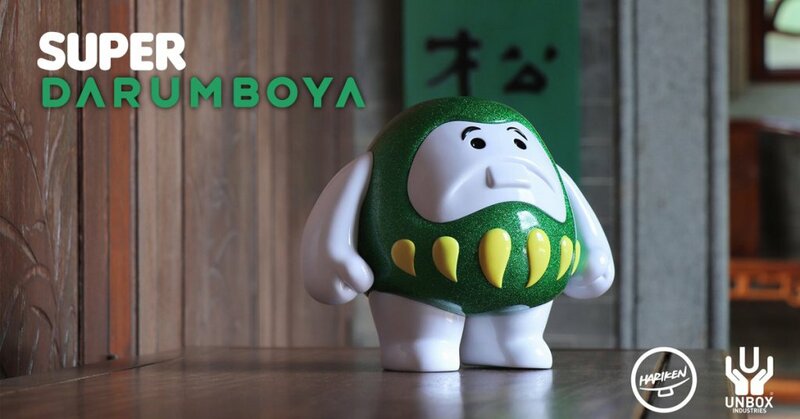 glittery soft vinyl and finished by hand, Super Darumboya is a future classic from this wonderful artist. LIMIT ONE DESIGN PER CUSTOMER.THANKS!